I stumbled upon the video below a week or two ago. The person in the video makes the case that bodyweight training is superior to weightlifting. Here we go again. For whatever reason, the BJJ community seems to be about at least a decade behind the strength community on these topics. It’s not that debates and arguments persist; it’s that certain arguments persist even in the face of evidence to the contrary, and this video hits on two biggest arguments. And now for a look at the arguments made. The video begins with his first factor, instability. He talks about in BJJ, the surface (your opponent) presents an unstable surface. As a result, we need to be able to use the smaller, stabliizer muscles in the body. Finally, as it pertains to instability training, is core activation. Essentially he is saying that because BJJ presents us with an unstable surface whereby the core and other stabilizer muscles are involved, BJJ practitioners should incorporate bodyweight exercises should be incorporated into one’s strength and conditioning program. In short, it’s where the training surface presents a challenge to the equilibrium of the body, and the body then has to work to maintain that equilibrium. I also want to note what is listed first; external loads such as dumbbells and barbells. Okay, but that’s not what’s being discussed in the video so we’ll just ignore it for now. And yes, this is a phenomenon found in jiu-jitsu. So what? Just because an element is present in the practice of an activity does not mean that it must be present in the training of that activity. Training can break down a specific activity into individual attributes (i.e., skill, strength, cardio-vascular endurance, etc.) and train those parts independent of one another. So you can perform skill training without the presence of strength training, strength training without the presence of skill training, and so on. I’d say the EMG reporting of training in an unstable environment (increased EMG activity, increased co-contraction and stabilizers) laid the groundwork for rehabilitation theory, and that theory seeped into S&C somehow—as in: If we can get more muscles activated then we will get greater force production and therefore more power and, of course, our athletes will improve their ability tor balance as well. Ergo, if an athlete can bench press or squat while trying to balance the load and their body then they will move even more load when the training is under stable conditions, right?! Uh, no, it’s not that simple at all. Across the board, there was an overwhelming conclusion in the literature that training with unstable conditions leads to lower muscular force and power production. Again, this does not mean that there was zero force or power produced or that other populations could not benefit from it. Yet, the ineffectiveness shown in other populations leads me to a strong hypothesis that instability training provides little benefit at the collegiate, professional, or elite level. What does this mean? When you are training in sub-optimal conditions, the body’s ability to produce maximal forces is compromised. Think of it like this. If you want to generate the maximal force hitting an object, would you chose a golf club, which has a smaller surface area and therefore does not displace the force of the strike, or a paddle, which has a larger surface area and therefore does displace the force of the strike? While instability training does not increase the training surface area, force is essentially displaced because the body has to generate force both to stabilize itself, and to move the weight (whether that is a loaded barbell, kettlebell, or the body itself). Since the body can only generate so much force, some of that force will be bled off to stabilize it, and as a result, the body is not training at optimal conditions, and is not training for maximal force output. How does this happen? There are two types of muscles in the body; stabilizers and movers. Stabilizers stabilize the joint, while the movers move the weight. Pretty simple. When the stabilizers alone are unable to stabilize the weight, which can happen either due to muscular imbalances or during instability training, the movers have to assume some of the stabilizing role; hence force production is bled off. So it doesn’t matter if you do bodyweight exercises, use metal weights or even make some dumbbells out of feathers! It’s a weight and it’s all resistance. What’s most important is how you train, what exercises you choose to do and how many reps, sets and rest intervals you have and how hard you work. So in summary, reps, sets, rest intervals and how much you put in will determine the amount and type of adaptation you will produce. It’s really disingenuous to impliedly argue that weight does not play a factor in adaptation, which that part does by excluding weight (i.e., stimulus) when discussing the important factors in your training. Why leave it out? Because with bodyweight exercises, the weight is fixed to your bodyweight, and this is a limitation to bodyweight exercises. Yes 35 pounds of feathers weighs the same as 35 pounds of lead, but the argument ignores the fact that the benefit to weighliftign is that you can increase the load beyond your body weight. And you cannot argue around that (hence the exclusion). But I think this author, like most advocates of ‘bodyweight over barbells’, is aware of this limitation, and addresses in the next section. Why when you can overhead press more than your bodyweight do you find the bodyweight equivalent so much harder or even ‘impossible’! Truth is it’s going to be a number of reason but one of the main ones will be the balance demand and the fact that you may be disorientated upside down and even potentially scared of falling and banging your head. But there are more reasons and they are the main additional benefits you get from calisthenics. One of the reasons it’s harder is that when you’re gripping the floor and trying to balance it means the sensory feedback to your brain is different to holding the solid and stable bar. Balancing on your hands requires fine motor skills of the hand and wrist. Even if you take out the balance factor and have your feet supporting on the wall. It’s still a much less stable position for the shoulder and therefore the muscles that stabilise the shoulder (scapular stabilisers and surrounding muscles) have to work much harder. ‘Throw in the kitchen sink.’ Basically, all these complicating factors makes one exercise better than another. Might be true, might not; it all depends on the goal. If the goal is strength, well then no, adding complicating factors which makes training conditions sub-optimal does not make the exercise better. For instance; the more reps in a set you do, the more fatigued the body is, but high rep sets are not ideal for maximizing strength. This is why different set/rep/weight schemes are used depending on the type of response a person is looking for—unless we want to toss out block periodization. But back to the point; often the kitchen sink gets tossed into the argument when bodyweight exercises are being argued for being superior for developing strength (which the School of Calisthenics does by arguing “[s]o it doesn’t matter if you do bodyweight exercises, use metal weights or even make some dumbbells out of feathers! It’s a weight and it’s all resistance.”). I think this is a profalactic measure so that when it is pointed out bodyweight exercises are inferior for building pure strength because the load placed on the body is limited, the kitchen sink argument is ready to go. And there is another argument antenuated to this that attempts to counter the point about external load limitations with bodyweight exercises; exercise variation. For instance, push-ups are great, but they are external load limited unless you had other weights (i.e., a weight vest, bands, etc.). So, bodyweight exercise proponents will argue that push-ups variations make the exercise harder, and therefore overcome that deficiency. That’s often misleading. Let’s take the push-up variation, the diamond push-up. Basically the hands are brought in close together and placed next to one another to make a diamond shape. Harder? Sure, but it’s still misleading. The reason it’s misleading is that it is harder because the load is being shifted from one muscle group (pecs) to another (triceps). Both are involved in each variation, but which is the dominant mover changes. Secondly, if anyone believes that weightlifting does not activate the core, then they’ve probably never squatted or deadlifted. People who have squatted double bodyweight damn well know the need for the core. Some research has shown back squats result in greater core activation than prone bridging. Of course, the primary benefit of back squats isn’t core work; that might better be achieved elsewhere. In fact, some lifters have to focus on the core work (or other specific areas) to overcome deficiencies that negatively impact their back squat, but the point is the major lifts incorporate the core. Now he does mention some research; specifically research showing that there is greater core activation when doing push-ups on a suspension trainer vs bench press. I couldn’t find this study, but I don’t doubt his telling of the results. However, and this goes back to the first point, that’s not relevant. Again, think about force production and why you’re doing a particular exercise. Are you doing bench press for core activation, or to increase upper-body strength? If your purpose is core activation, then maybe push-ups on a suspension trainer (or squats as noted in the previous paragraph) aren’t best either. In short; all forms of exercise are tools that can train various attributes to various levels. This issue is to decide what the goal is and to pick accordingly. Here he makes two arguments in relation to “joint angles”; the movement of limbs in relation to the body, and reaching full range of motion for joint health. No, no, no, no, no, no, no . . . NO! In other words, skill and strength training are not the same thing, typically. One exception would be strength athletes whose sport specific skill is also a strength movement. However, when strength athletes do skill work, meaning the work on the lifts relevant to their sports, they focus on improving technique, and in order to do this lift with sub-maximal weights. Why sub-maximal weights? Because the focus is not strength but the movement and preparing the body how to move, and it is easier to focus on movement patterns when the body is not under maximal stress. That’s why weightlifters use sub-maximal weights, sprinters run at reduced speeds, baseball players hit off tees, and so forth. 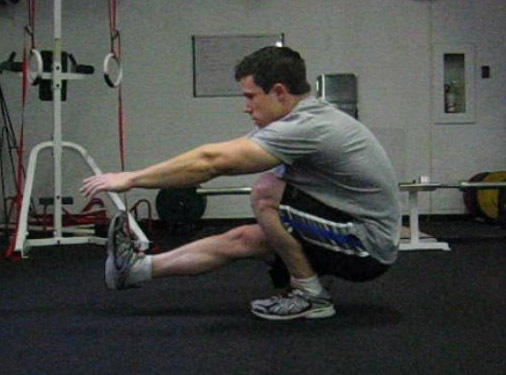 Additionally, and along the lines of something mentioned above, even accepting the premise that more sport specific movements against resistance to better prepare the body for movement, there is nothing magical about bodyweight exercises. Some might fall into this paradigm, but many do not. Let’s take pull-ups. How often in jiu-jitsu are we pulling straight down from over head against resistance (either pulling weight down, or pulling ourselves up)? What about push-ups (even on a suspension trainer) where we are parallel to the floor and pushing ourselves directly up? In short, if you want to work a skill or particular movement pattern, then do that. If you want to work on increasing strength, then do that. The second argument made in the video regarding joint angles and why bodyweight exercises are superior to weightlifting is joint health. He argues that to increase synovial fluid and other nutrients to the joint you need achieve a full range of motion. Because many people do not achieve this full ROM in back squats, for instance, pistol squats are preferred. Okay . . . two things. First, I could not find research regarding his argument about synovial fluid and full ROM exercises (except for a 1999 study that involved 5 sheep). Absent my ability to find research on the topic, I read enough people stating the same people that I will accept what he is saying is true. Assuming that is true, why couldn’t someone who does heavy back squats also do pistols (or other full ROM exercise) as a supplement and achieve this benefit? This, again, is not a case against weightlifting; it’s an issue of programming. Moreover, arguing that weightlifting is not adequate because people do it poorly is, well, a poor argument. Pistol squats are argued in the video to be better for joint health because not everyone goes to depth in squat. Okay, but . . .
. . . that doesn’t make them any less fallible the ill-performed squats. Sure your knee might be healthy, but let me know how your back likes that much flexion—and we still have the issue that pistol squats are not as efficient as squats in terms of strength development. Are there benefits to bodyweight training? Yes. Can you get strong from bodyweight training? Yes. Are the bodyweight exercises noted in the video and linked article good? Yes. Would it be worth it to incorporate bodyweight exercises into one’s lifting program? Probably. Is bodyweight training superior to weightlifting in terms of pure strength training? No. Again, it is not an issue of one being per se good and the other per se bad, it’s about understanding what each is designed for and applying it correctly to one’s training.